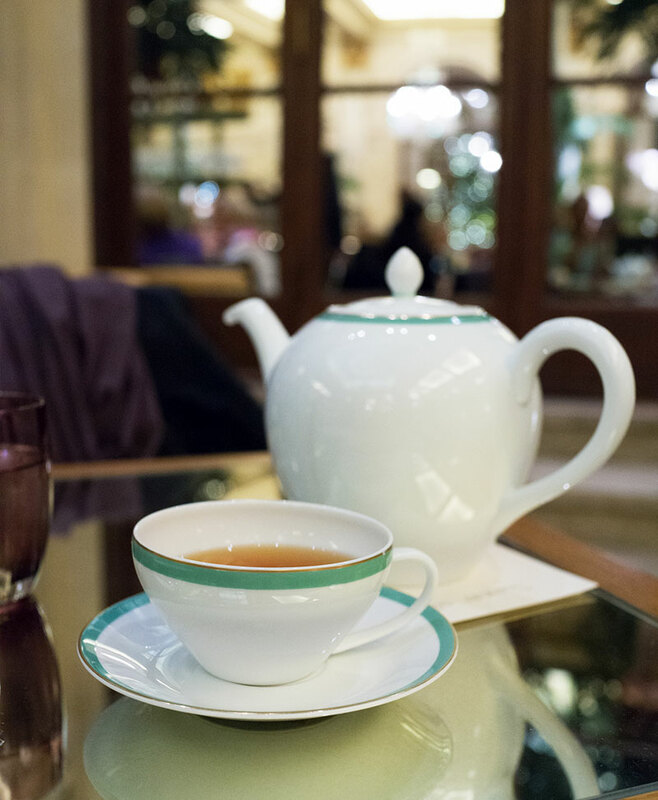 Tea at The Plaza is what comes to mind when anyone suggests afternoon tea in New York City. Is it worth the hype? Let’s find out — read on for my review of the service, the tea, and the food. 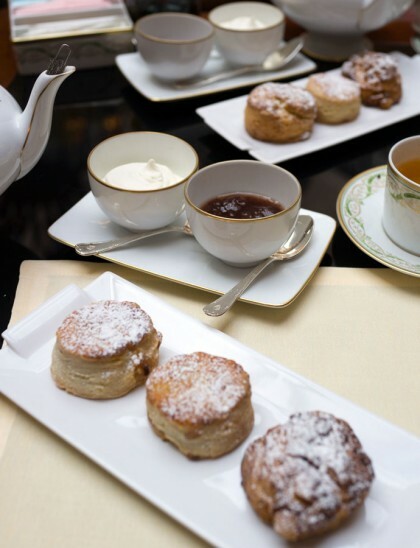 The Plaza is the one place most people think of when they think of afternoon tea in New York City. Situated directly across from Central Park, the luxury hotel’s location can’t be beat. Looking majestic and regal, The Plaza is a sight to behold for tourists and locals alike. The hotel is iconic and the afternoon tea served inside the Palm Court is considered a quintessential New York experience. Because The Plaza is well aware how popular their afternoon tea is, they can charge a lot more than most afternoon tea places, and they do. Afternoon tea started as a way for a Duchess in England in the 18040s to have a small bite to fend off hunger between lunch and dinner. This habit of having a light meal became afternoon tea. Afternoon tea is a set menu. 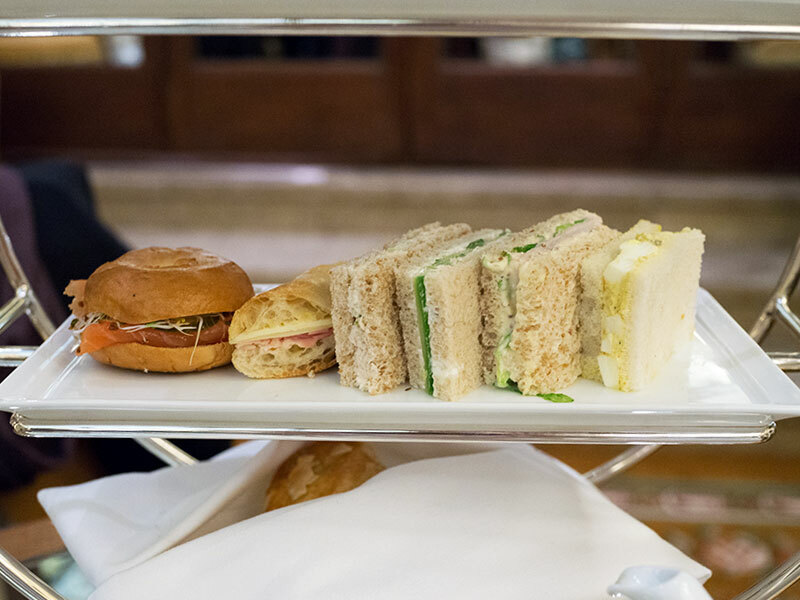 You order per person and each order comes with a pot of tea and three courses of food that consist of tea sandwiches, scones, and sweets on a three-tiered tray. You don’t pick the food items because afternoon tea is a set menu — you get what everyone else gets. All food items can usually be eaten in two bites with your fingers, from the tea sandwiches to the sweets. Just a quick mention that afternoon tea is definitely not the same thing as high tea. If you want high tea at The Plaza, that meal would involve meat dishes and baked beans, not finger sandwiches and mini desserts. 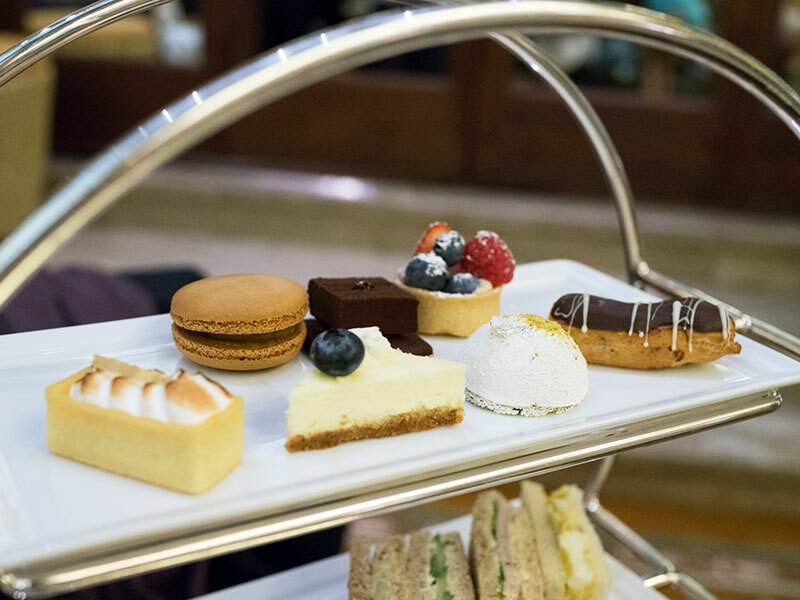 Does The Plaza Have More Than One Kind of Afternoon Tea on the Menu? Yes! 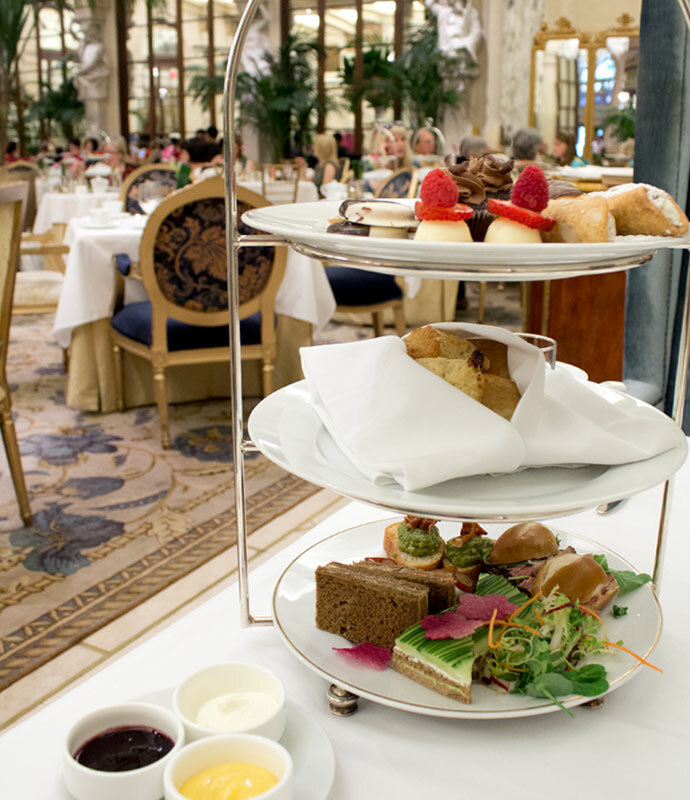 The Plaza has three afternoon tea options. There is The New Yorker Tea (which is what I always order), The Champagne Tea (comes with Champagne and costs more), and The Children’s Eloise Tea (for kids under 12 years old). How Much is Afternoon Tea at The Plaza? 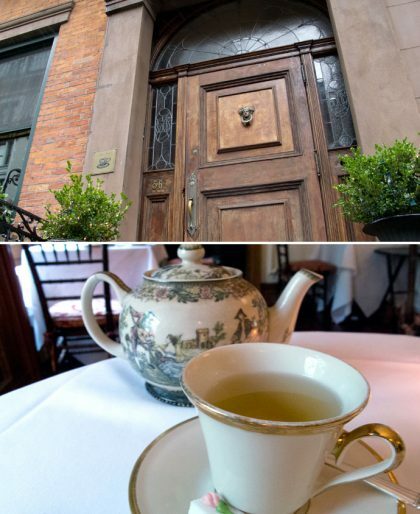 The New Yorker Tea is the classic and it’s $75 per person. Six small tea sandwiches, scones, and a variety of bite-sized sweets. Add Champagne and it goes up to $90 per person. The Champagne Tea at $95 per person offers more higher-end food options like foie gras and lobster. This one comes with Champagne as I’m sure you figured out. You can add caviar for an extra cost. The Children’s Eloise Tea is $60 per child under 12 years old. Hot fruity and herbal teas are listed but lemonade and iced tea are also options. This tea service is very kid-friendly with peanut butter and jelly tea sandwiches and cotton candy for the third sweets course. Do I Need to Make a Reservation for Afternoon Tea at The Plaza? Yes. For any afternoon tea, make a reservation to be on the safe side. Most places require it. What Do I Wear for Tea at The Plaza? The suggested dress code is smart casual. If you have a nice party dress you’ve been wanting to wear, this is the place. Jeans and sneakers are to be avoided. How Long is Afternoon Tea at The Plaza? Afternoon tea usually lasts about two hours. It’s a very relaxed and civilized way to spend an afternoon. What Time is Afternoon Tea at The Plaza? 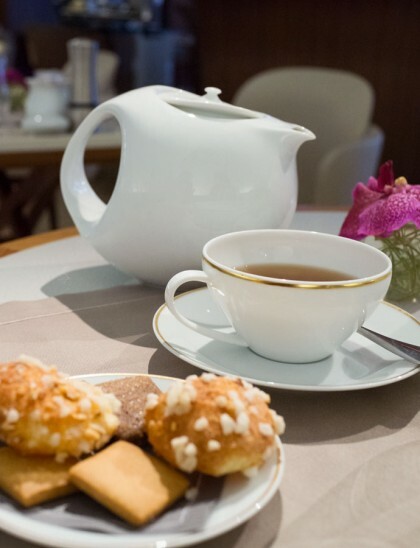 Tea service is every day from noon until 4:45PM. The last seating is at 4:30PM. I like to go for tea at 3PM since I won’t feel rushed and so I won’t be too full for a light dinner. 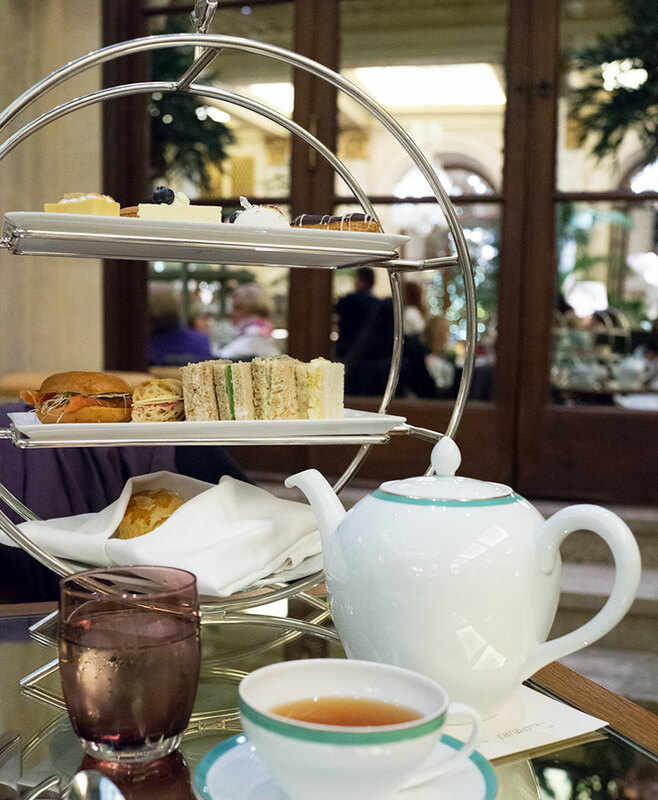 How Does Afternoon Tea at the Plaza Work? 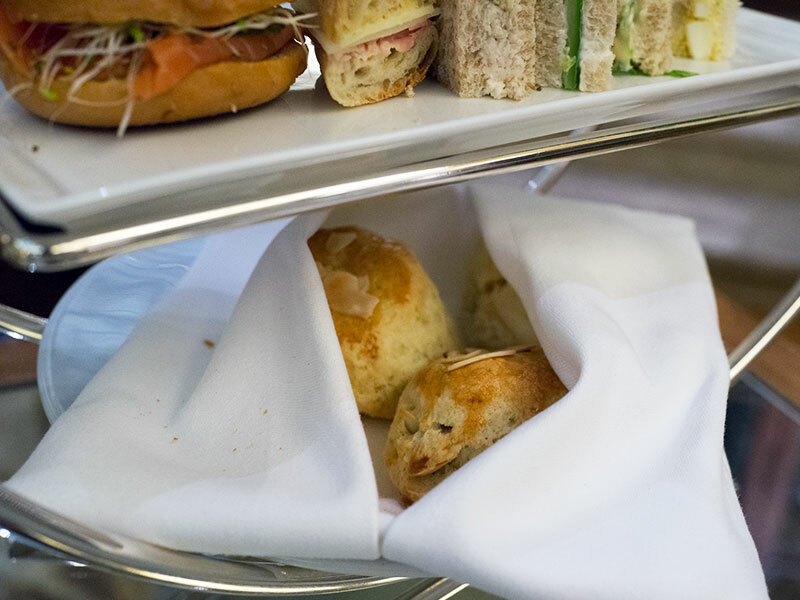 The food listed in each of those afternoon teas all come out together — you don’t pick and choose. The only thing you need to pick with your order is tea, which is listed on a tea menu. Black tea is usually the most popular to get with your afternoon tea. Don’t get the pricier teas listed for an extra cost — not worth it. 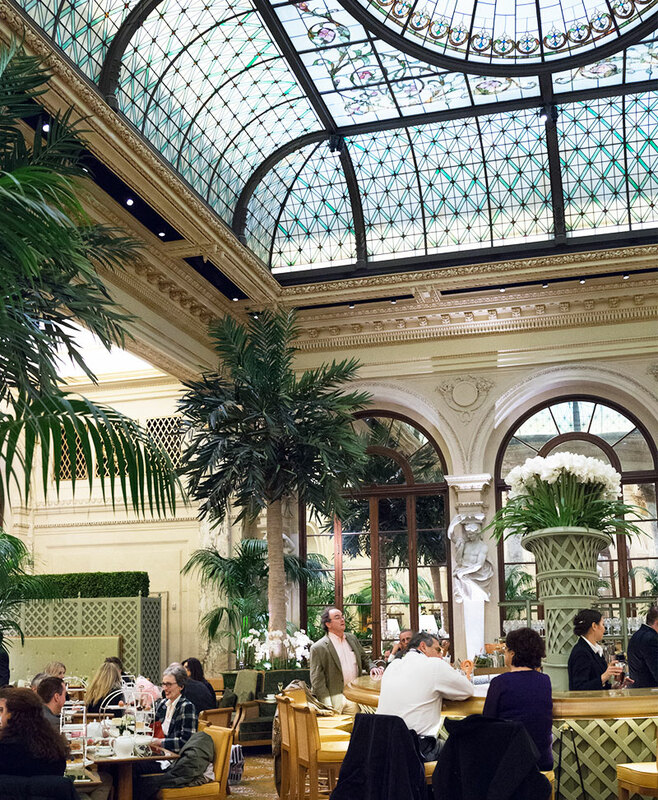 The Palm Court is in the dining area on The Plaza’s first floor where afternoon tea is served. They had a remodel a couple of years ago and the room had a distinct tea room feel — intimate seating with high-back chairs, back then. The redesign of the room has more of a lounge look to it with the giant circular bar in the center of the room. Gone are the white tablecloths (replaced with mirrored surface tables), the tables are much closer together, and overall, the space feels more casual. 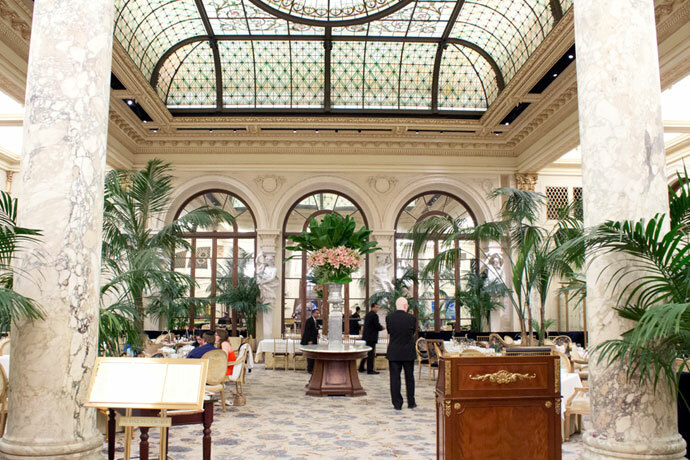 I prefered the look of the Palm Court before their remodel, when it was more of a formal tea room and the Palm Court was exclusively for tea in the afternoon. The service was very friendly and our server did a great job explaining the items on the menu that we had questions about. Everything was done with a smile. The tea menu consists mostly of tea blends but if you want to get any higher-end whole leaf tea, you have to pay a supplement that goes from $8 to $30. I’m going to start a rant here. You’ve been warned. WHY? FOR THE LOVE OF GOD WOULD YOU CHARGE ME $8 MORE WHEN I’M ALREADY PAYING $75 FOR AFTERNOON TEA??? I have a huge issue with afternoon teas charging extra for certain types of teas. Why do you need to nickel and dime? Tea blends like English Breakfast and Earl Grey are cheaper than whole leaf teas and that’s why they’re included in the price of afternoon teas. Whole/pure leaf teas like Jukro and Yunnan Buds are better quality tea but it’s out of place on an afternoon tea menu. Serving whole leaf teas in giant teapots is completely the wrong way to prepare and serve really expensive tea since you’re not getting the full experience and taste. I’m basically mad that The Plaza is trying to trick you. If you’re knowledgeable about tea, you would never order such an expensive one that had a $30 extra charge with afternoon tea. It’s there for people who may want to splurge and try something new but don’t know the proper way it is supposed to be served. Tsk, tsk, Plaza. The Plaza serves tea from Palais des Thes which is one of the tea companies I recommend and I do like their blends. Let’s talk about the magical teapot. It looks normal sized but somehow poured endless cups of tea. (I didn’t even need to ask for more hot water which is rare!) I liked how they used a rectangular piece of paper that was placed under the teapot with the name of the tea printed on it (or written in my case). I ordered “The New Yorker Tea” and it came out on a circular three-tiered tray. The sweets at the top, savories in the middle, and scones on the bottom tray. The presentation is lovely. Let me first start by saying that the afternoon tea at The Plaza is a whopping $75, which is more than most other hotel afternoon tea services. With the premium pricing, I want DAMN good tea sandwiches and The Plaza failed to deliver. For that price I want my savories prepared tableside! (Haha, ok, that may be taking it too far.) The tea sandwiches looked a little sloppy, although they tasted perfectly fine, they were NOT “$75 for afternoon tea” fine. The scones came out warm, wrapped in a cloth napkin. I knocked off a star since they brought out one set of clotted cream and jams even though we were a party of three. I really wish they had brought out three sets. One set was definitely not enough, so we did ask for another. The sweets were excellent, with a nice variety — delicate and tasty. Each mini sweet treat was perfectly portioned and adorable. This was my favorite course. Is it overpriced? YES. Is it worth going to at least once? YES. The Palm Court back in 2013. Blue velvet high-back chairs on the outer tables and armchairs in the middle tables. Their three-tier stand when the afternoon tea was just $50. Hi Laura, it was worth going at least once! We had afternoon tea at the Plaza today. It was $75/adult and the Eloise tea for the kids was $55. I tried my daughter’s candy floss but it was mint flavored so kind of disgusting though it did look super cute on the pretzel rod. Hi Mrs. Habu, wow, $75 — that’s a little steep but I guess they can get away with it since it seems like such a NYC institution to have afternoon tea at The Plaza. Thanks for the update — I’ll need to go back to update my review. Thank you for the excellent review. I am bringing my 2 daughters and 2 granddaughters to NYC in a few weeks. 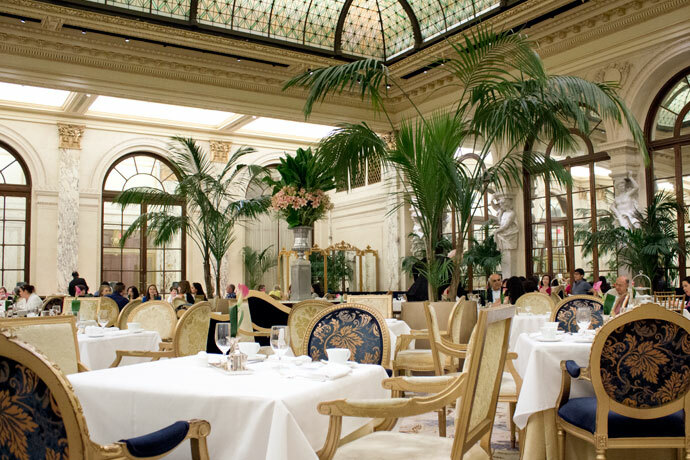 Questions:: Are the New Yorker Tea and the Eloise Tea served at the same time in the Palm Room? Is it possible for adults to order New Yorker Tea and teens to order Eloise Tea while seated at the same table? Hi Carolyn, yes, the adults can order the New Yorker Tea and the granddaughters can get the Eloise Tea at the same table. Have a wonderful afternoon! Hi! I am planning to go with 3 of my friends for my 19th birthday and I wanted to ask what the price range would look like? Thank you! Hi Sangay, what a great way to celebrate a birthday! The Plaza only does three afternoon teas: The New Yorker Tea ($75 per person), The Champagne Tea ($95 per person), and The Children’s Eloise Tea. For the four of you, it would be $300 without tip or tax total. When in Hong Kong try the chocolate library for high tea at the ritz carlton , on the 105 th floor ! Devine. An open mini bookshelf offers 6 chocolate delights !!!! Sandwichs /scones and lovely tea choices! About $50 U.S. so worth every penny . Stop by the spa , loved their gift shop. This tea is a must . High tea around the world is my hobby . Ritz carlton Singapore high tea has 8 courses, about $5o us. So much food, Chuhuly glass chandeliers , orchids everywhere ,grand piano , great service, a little table/stool to place your purse … Heaven . Don’t miss these two world class teas. Hi Liz, not silly at all! I think most places should be able to replace his tea with coffee if you ask. You can also call ahead of time to put in the request. My friend and I took our young daughters for tea at the Plaza. We wanted to do something fancy and fun over christmas. We decided to do the Eliose Tea as it was more expensive and thought it would a complete splurge and treat. It is about 100$ each, even for kids. This tea was terrible. It was crowded and cheaply done. I had a tea birthday party in my home for my daughter and it was 100 times better than this. For 200$ would you expect paper plates and plastic cups? I wanted regular black tea but they only had terrible fake taking flavored tea. The food was very basic- i think 3 different basic sandwiches and 1 type of cupcake that could have been bought at grocery store. I was also about 6 months pregnant and the only seating was in a kids size chair which was a preschool wooden chair. The whole experience was cheap and tasteless. The area of the plaza was crowded and it was not at all relaxed or fancy. The food and tea was minimal and absolutely nothing special. When I asked for sparkling water- no go. Very bare bones. Nothing fancy or special. I called to complain, i wanted my 200$ back for this 5$ tea. I got the run around and was directed to call STEVEN MILLER. I left him about 3 different messages and he never called me back. Seems like the service is equivalent to the tea. How has this place lasted so long??? Terrible service, terrible, cheap tea. DO NOT WASTE YOUR MONEY AND TIME!!! !